Your student is sitting at the dining room table. He’s supposed to be doing his math assignment. Instead, he’s doodling his hate for the subject in the margins. He’s already tried multiplying 52×28 but keeps getting the wrong answer. You’ve tried explaining it. Multiple times. But to no avail. He has given up and you’re about ready to join him. You start thinking, maybe it’s not that important. Maybe I should just get out the calculator. 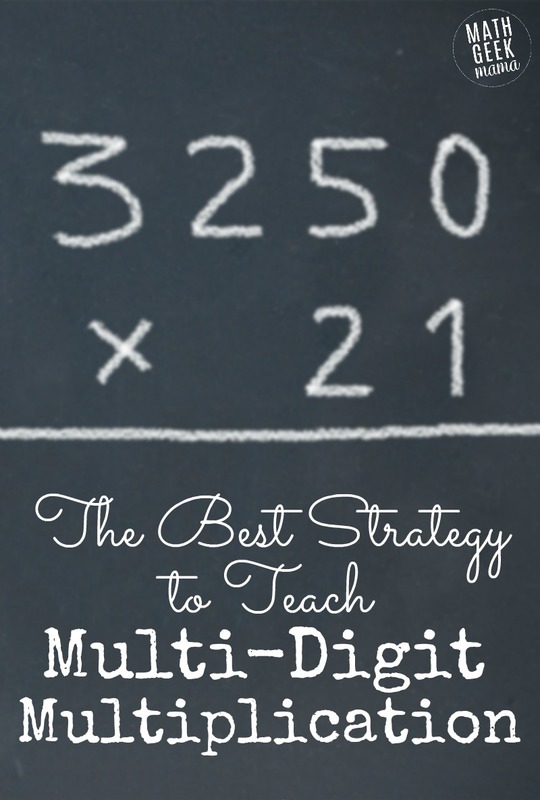 Before you give up, try showing your student this simple strategy for multi-digit multiplication. Show him how to multiply in a way that has meaning. Try using an area model. I’ll show you how. One of the most common mistakes teachers make is going too quickly into the abstract, which is probably why your student is stuck. 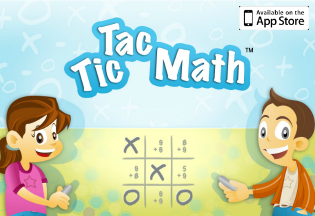 So, let’s go back a step and show what multi-digit multiplication means. I’m going to create a story around my model. I do this every time I teach a student a new concept. Having a story gives students something to visualize, something concrete to hold onto when they get confused. The story you tell isn’t super important. 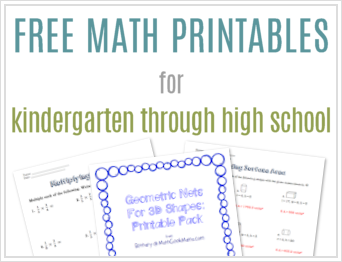 Pick something you think your student would be interested in. As you can tell from my drawing, accuracy isn’t super important either. Although with younger students it might matter more than older. The point is to be able to visualize all of the steps that need to be taken to solve the problem 52 x 28. How much carpet do we need for the whole room? 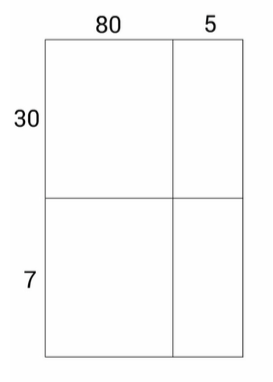 Add up all of the areas of each rectangle. Let’s set up another one to make sure you’ve got it down. Let’s say you want to solve the problem 85 x 37. 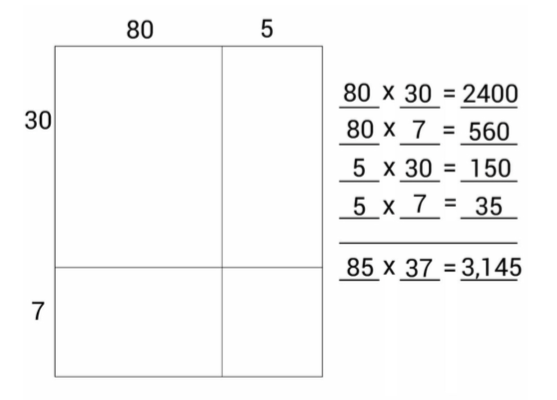 When I first teach students how to use this model, I have them split the numbers using expanded form. In this case, each number would be split into 10’s and 1’s. 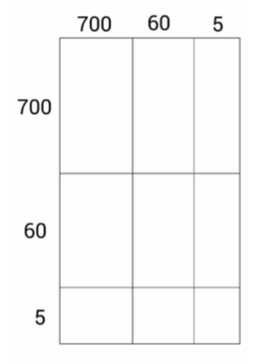 So we need a rectangle split once horizontally, and once vertically. Next step is to label each section. I’m going to put 85 across the top and 37 down the side. I could also have put 37 across the top and 85 down the side. Either will get you the same answer (commutative property of multiplication ;)). Now we find the area of each section. Once your student gets comfortable with this model, the story behind it won’t be necessary. In fact, they may be able to solve problems without it altogether. Next, let’s look at multiplying bigger numbers. The area model is so flexible you can use it with any size numbers you want. 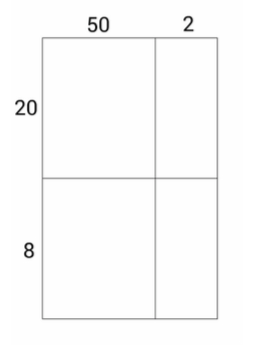 If you were multiplying 542 and 23, your box would have three sections by two sections. Multiplying 765 by 765 would have three sections by three sections and have nine problems to solve. 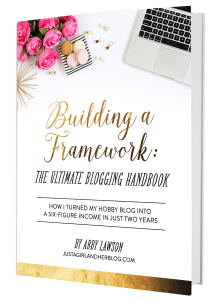 This is an excellent strategy! I did it before and it was very useful for those who really battled. 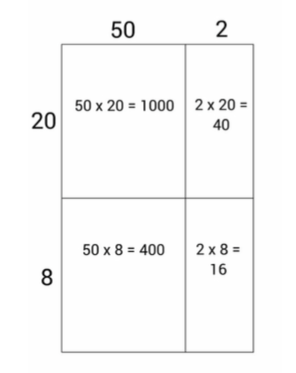 I love this idea of teaching multiplication! Thank you so much! Where have you been all my life? LOL Thanks again!